In June the road along to Foulsyke becomes even narrower than usual as the cow parsley and ferns grow too tall and lean over into the road. The meadow sweet is almost out and higher in the hedges roses and honeysuckle are flowering. 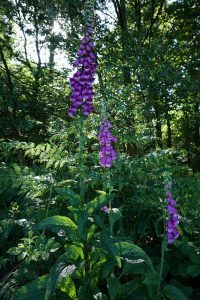 The foxgloves are looking particularly splendid as well. 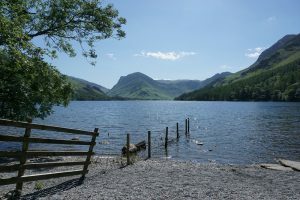 I have got swallows nesting in Crummock store and there have been various attempts to build a nest under the canopy by Buttermere. It’s a tricky build as there is so little to attach to to but the current effort is holding so far. It seems a long time since I wrote my last blog and a lot has happened since then including a General Election. 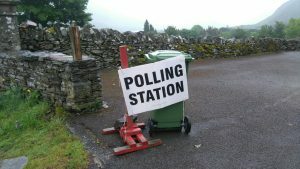 I always find it amusing when I go to vote at the village hall to find the polling station notice tied to the rubbish bins! 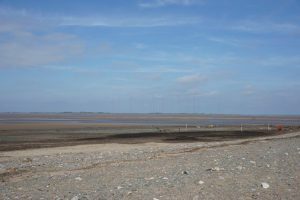 I had an old friend staying for a few days at the end of May and we decided to head for the coast one day and walked out to Grune Point on the Solway – the tide was out, it was quite desolate and we didn’t meet anyone at all but we heard a linnet singing. The summer season at Theatre by the Lake has got off to an excellent start with a stylish performance of Terence Rattigan’s ‘After the Dance’ and a very funny production of ‘Handbagged’. 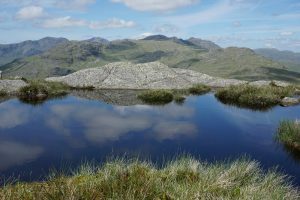 Also in Keswick there is a new exhibition which at Keswick Museum based on Terry Abrahams documentary on Blencathra. It is a very friendly small museum with lots of interesting exhibits and the small entry fee is valid for a year’s visits! 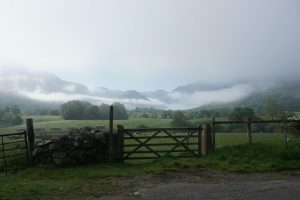 Although my walking activities are mainly in local or easily accessible places, every now and then I go further afield and a couple of weeks ago we went to the far reaches of the Duddon valley to climb some of the Coniston fells from the other side. It was a super day and the views towards the Scafell range were stunning.